A resource for healthy food kids will love eating and making, along with menu plans for the busy mom, and kitchen tool and cookbook reviews. Welcome, to In the Kids' Kitchen. Posts contain affiliate links for your convenience in recreating recipes/activities. Read our full disclosure policy here. 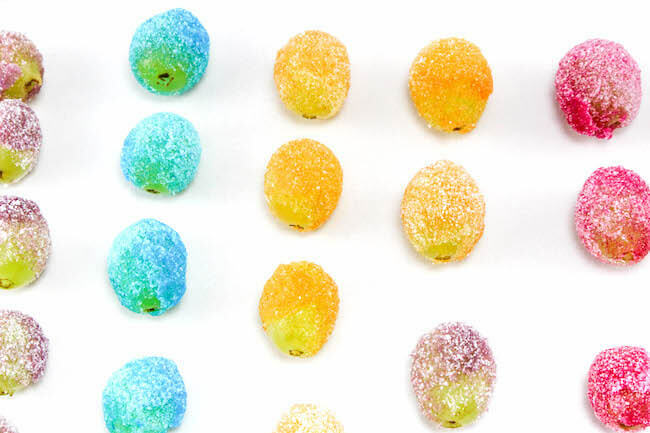 These vibrantly colored Rainbow Jello Frosted Grapes are as pretty as they are delicious! 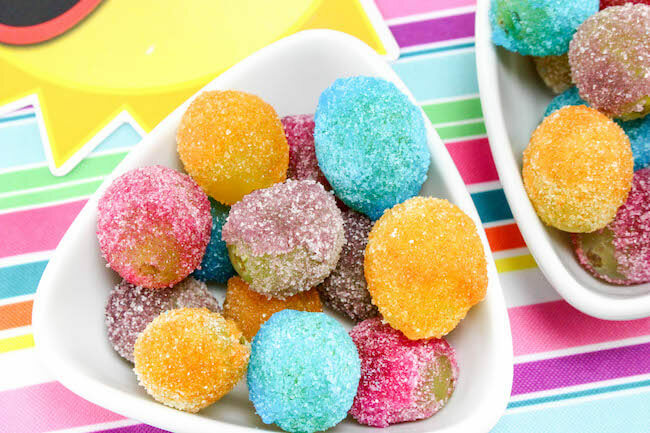 Whether it’s a simple summer snack or a centerpiece party treat, rainbow sugared grapes are guaranteed to be a a hit with both kids and grown-ups alike! 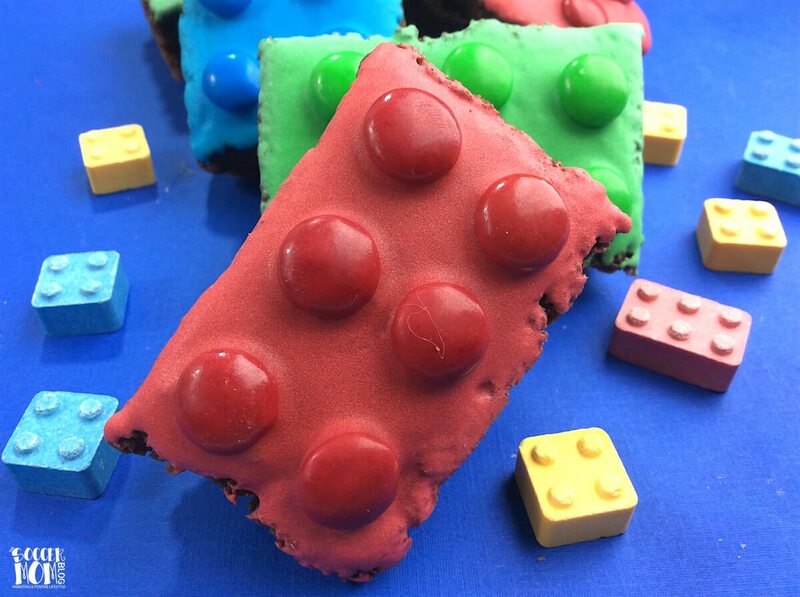 This recipe brings back so many childhood memories for me. When I was a kid, we used to dip our fingers in Jello packets at swim meets — for “energy” I think. Oh the 80s! 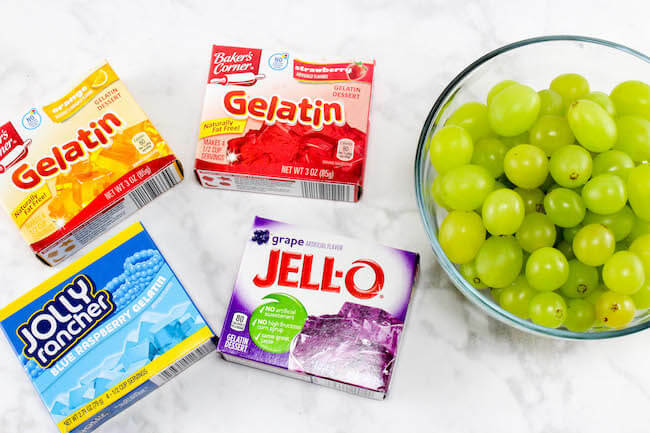 I like to think that these Jello frosted grapes are a bit healthier with the addition of grapes (you could also use strawberries or another fruit of your choosing). 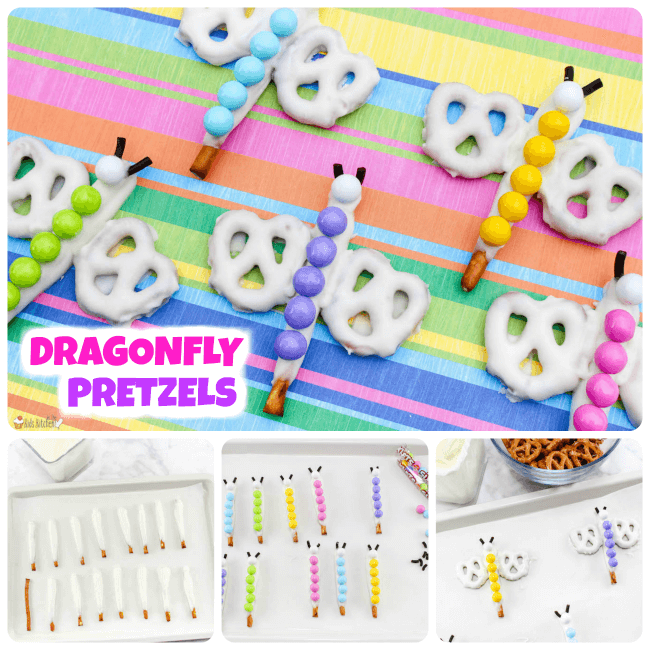 In any case, these sure are fun to make…and eat! Related: See what else you can make with Jello! Try our Jello popcorn too! 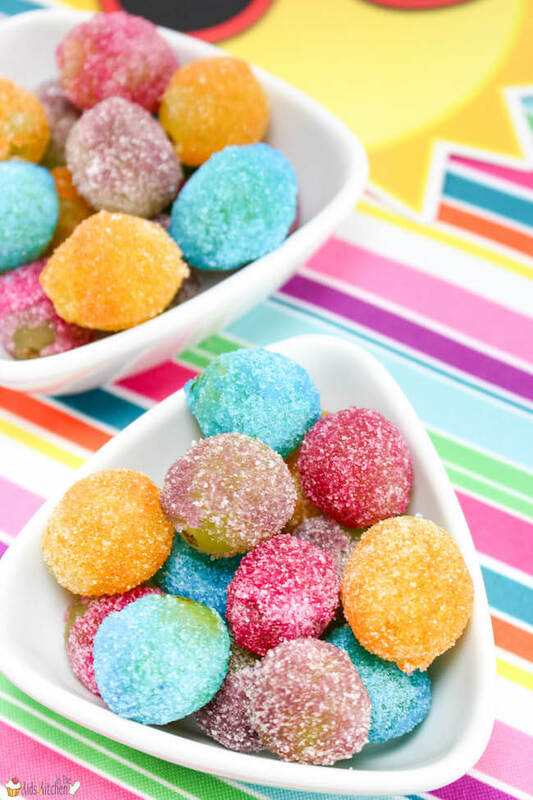 Only two ingredients needed — doesn’t get much easier than that! Wash and rinse grapes, then leave them in a bowl filled with water. 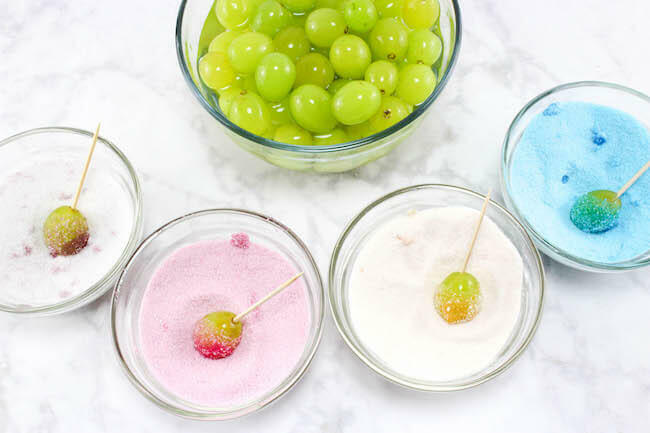 Pour each package of dry gelatin powder into 4 bowls, keeping each color separate. 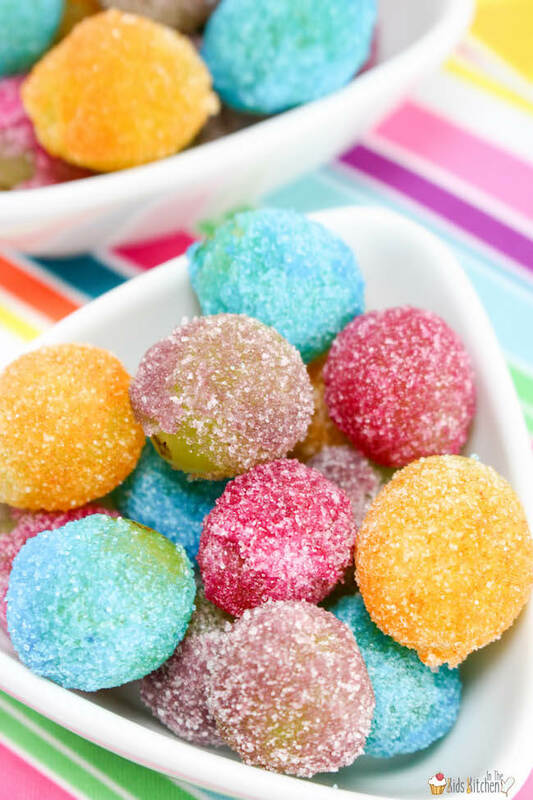 Take a grape from your bowl of water and, while the grape is still wet, roll in one color gelatin powder until thoroughly coated. Repeat using all the grapes, varying the colors used, and lay them on a baking sheet. Tip: Use a toothpick to hold the grapes while coloring, to keep your hands from staining. Refrigerate grapes for 1-2 hours, or until the powdered coating hardens on the grapes. 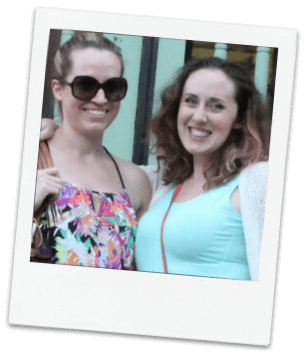 We're Stacey and Jennifer, and we're so glad you stopped by to visit! In the Kids Kitchen is our place to share inspiration to cook, play, and learn with your kids. From tips for teaching kitchen skills, to family-friendly recipes, kitchen crafts & sensory play, cookbook reviews, and more!